The Voter Registrar is responsible for handling voter registration, managing absentee voting, reporting and maintaining candidate filings, overseeing polling places, training election officials to work the polls, and recording & reporting election results. 0101 - County Seat Municipal Building 350 George Washington Hwy. 0201-Red Oak / Wylliesburg Bacon District Fire Department 2000 Barnesville Hwy. Central Absentee Precinct Registrar's Office 420 Thomas Jefferson Hwy. Statewide general elections are held each year on the Tuesday following the first Monday in November for the purpose of electing federal or state executive and legislative representatives. In order to vote in the general election voters must be registered 29 days prior to the election. The 2011 map of Charlotte County's voting precincts can be viewed here. Please note that since the map was developed, the number of polling places in both the Cullen/Red House and Bacon/Saxe District has been reduced to one polling place each. Unfortunately, an updated map is not available. To confirm your voting location please contact the Voter Registrar's Office or visit the State Board of Elections' citizen portal here and, after reading the provided information, click on GO at the bottom right corner of the screen. Charlotte County elects Constitutional officers (offices prescribed by the Constitution of Virginia - Sheriff, Attorney for the Commonwealth, Treasurer, Commissioner of the Revenue, and Clerk of the Circuit Court), as well as members of the Board of Supervisors & School Board during November general elections. Local offices are usually elected in odd-numbered years. The Clerk of the Circuit Court is elected to serve an eight year term while all other officers are elected to serve four year terms. For more information regarding voting, voting districts, and elections, or to register to vote, please contact Nan Lambert, Voter Registrar, or visit the State Board of Elections website. 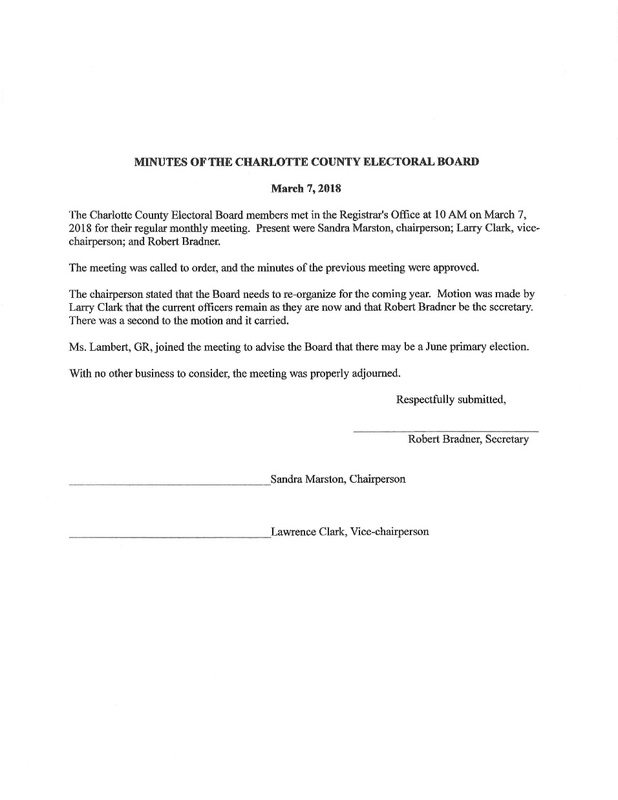 Charlotte County's Electoral Board meets the first Wednesday of every month at 10:00 am at the Voter Registrar's Office located at 420 Thomas Jefferson Hwy, Charlotte Court House, Virginia.